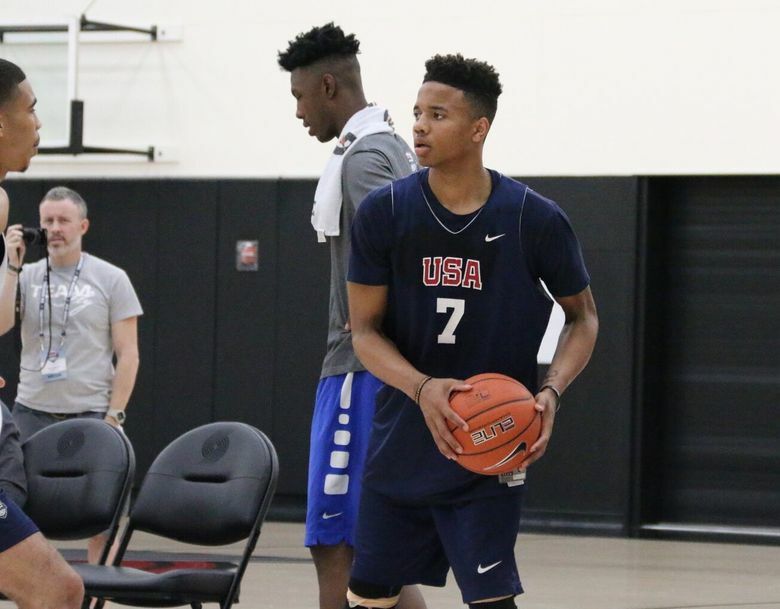 Fultz receives early rave reviews while working out with USA Junior National Team at the Portland Trail Blazers practice facility. Washington Husky signee Markelle Fultz impressed on the first day of practice this week in preparation for Saturday’s Nike Hoop Summit at Portland’s Moda Center. Fultz, a five-star guard from DeMatha Catholic in Hyattsville, MD, is one of 13 players chosen to the USA Basketball Junior National Select team. Here’s the scouting report on Fultz from Mike Schmitz at Draft Express. “Washington signee Markelle Fultz also impressed with his combination of scoring and distributing. At 6′ 4” with a 6′ 8.5” wingspan, big hands and a nice frame, Fultz has the tools and game to play either guard spot, although he shined most as a primary ball handler on Wednesday. He’s slippery with the ball thanks to his ability to change speeds and directions on a dime, and plays with a level of creativity you don’t often see among kids his age. The Nike Hoop Summit will be televised live at 12 p.m. (PT), Saturday on ESPN2. Next week, Fultz wraps up a postseason whirlwind all-star circuit with the Jordan Brand Classic on April 15 at the Barclays Center in Brooklyn, NY. Last week, Fulz played in the McDonald’s All-American game. He finished with 10 points on 4-for-12 shooting, six assists, four rebounds and three steals in 15 minutes. Here’s the box score.